One such latest development in the direction of anti counterfeiting process available for brand and sensitive document protection is Cryptoglyph™ process ( a digital image file) that acts as a perfect security feature to embed pseudo-random pattern of microdots (10 to 20 microns) in the imperfections of the printed material. 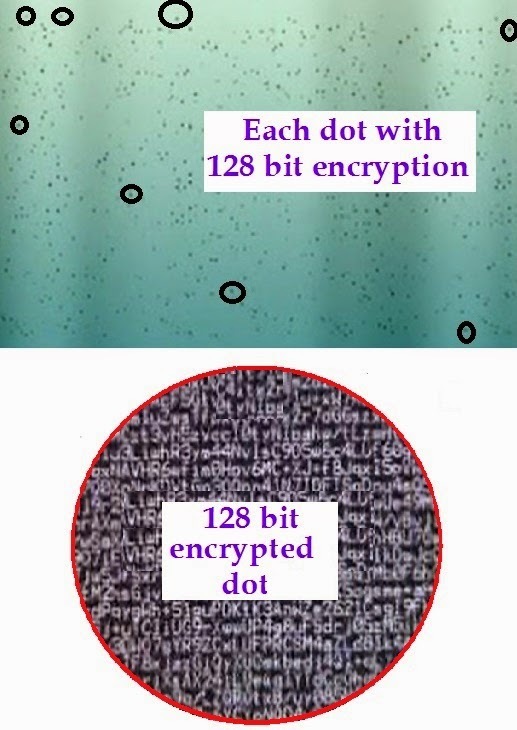 These invisible micro-points contain encrypted information, which can only be deciphered by using a 128 or 2^ bit encryption key. If the detection process is performed in a unique and secured place, the key is never endangered. Deciphering the information by a fraudulent party is impossible. They are very difficult to distinguish - even under magnification - as the dots are hidden in the imperfections found in all printed material and thus completely camouflaged. Since Cryptoglyph™ is a digital imaging process that carries encrypted information it can also be used for authentication of the documents as well as brand protection through printed labels or prints on brand packs. This process is integrated with the standard printing process. 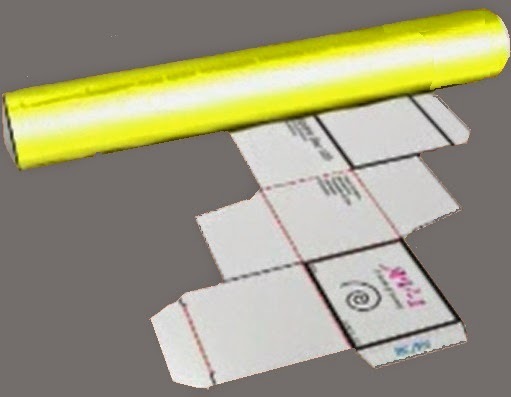 Printing of invisible micro-points called dots over the entire surface of the primary packaging or secondary packaging, such as the blister foil makes it impossible to replicate or to erase them. The Cryptoglyph™ is a distributed mark with an inherent redundancy and cannot be either destroyed or even modified once it is incorporated. Thus this feature can play a vital role in track and trace applications deployed for brand protection. Care has to be however taken to integrate Cryptoglyph™ into the product labels. Cryptoglyph™ is the invention of AlpVision and reported to be the only security feature available in the world that applies an invisible or covert marking on cartons, leaflets, labels, and blister packs using regular visible ink or varnish with standard printing processes. According to AlpVision, the Cryptoglyph™ technology is covert digital feature that can be embedded into security backgrounds of identity documents or other security documents. AlpVision SA, established in the year 2000 and based in Switzerland, is a leading supplier of digital security printing solutions. Besides digital imaging, another application of Cryptoglyph™ is that once the image has been created (i.e. printed), and the printed matter overprinted with a scratch resistant or protective varnish using Cryptoglyph™ process, it creates pseudo-random pattern of micro-holes (40 to 80 microns) on the coating, however without changing the printed design elements. 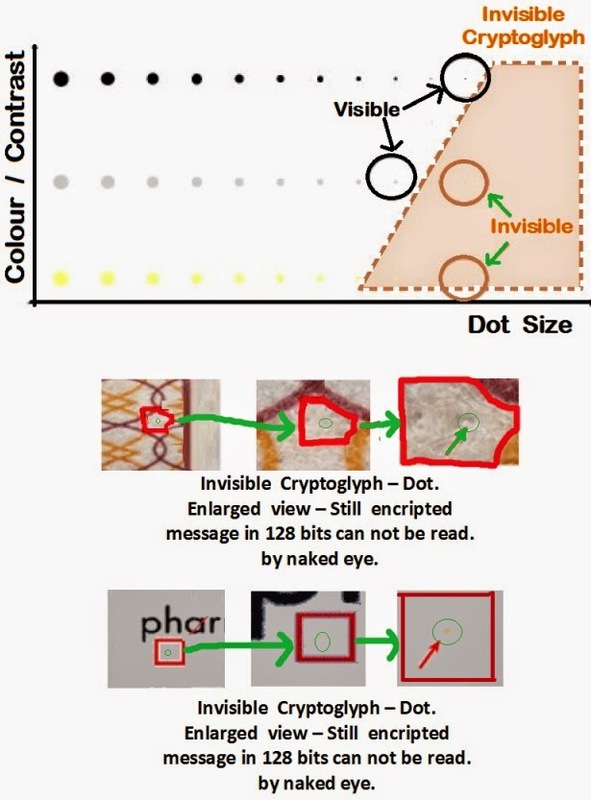 Thus the Cryptoglyph process can create invisible micro dots as well micro holes over the surface of the coating to remain as a perfect security feature on the printed material invisible to naked eyes. According to the manufacturer of Cryptoglyph™ the printed documents and labels carrying Cryptoglyph™ feature remain non copyable and serve as an effective and efficient means to protect the documents and product labels against counterfeiting. 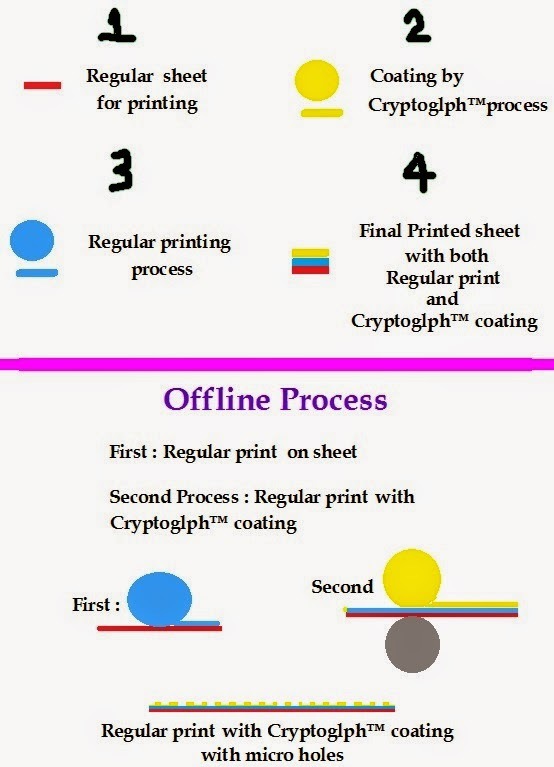 Major advantage on the application of Cryptoglyph™ onto a document or a product is that it requires no special equipment or changes in consumables used and instead the standard equipments and machineries like Offset, Rotogravure, Laser or Inkjet can incorporate this feature. However it is learnt that the best medium used for incorporating the Cryptoglyph™ is Offset Printing process or by offline digital process. For the detection and verification of the Cryptoglyph, this translates into using off-the-shelf image acquisition devices, such as scanners and digital cameras.